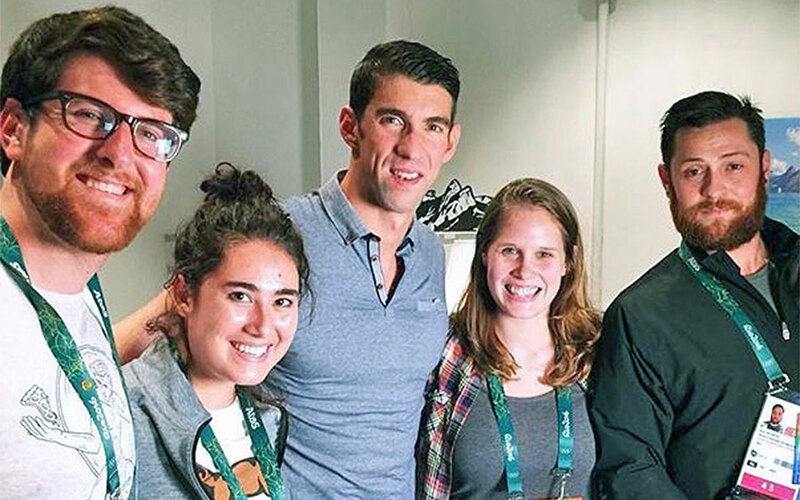 Brent Bennett (C’14), on the far left, joined a 12-person team of BuzzFeed colleagues sent to Rio de Janeiro in August to create video content for the official NBC Olympics Snapchat Discover Channel. With roundups of each day’s events and quirky video segments with athletes, the Snapchat coverage drew substantial attention—mounting to 35 million viewers over the two-week period. As video producer with BuzzFeed Motion Pictures in Los Angeles, Bennett is at the forefront of the sea change taking place in the way millennials—and many others—consume media. And, of course, advertisers are taking note of the shift toward live-streaming and on-demand, subscription-based videos. Ford, Wal-Mart, and Samsung all drop ads into the Snapchat content Bennett helps produce. Bennett credits the combination of his liberal arts education at Principia and the practical experience he gained on campus with landing him the job at BuzzFeed. Bennett majored in biology, including studying at Duke University’s Marine Lab, and traveled on the Iceland Abroad and the Performing Arts Abroad in Europe. He also worked part time on the video and tech crews for Media Services. “During interviews at BuzzFeed, hiring managers were more interested in my science and liberal arts background, which gave me a unique identity, than the specific practical skills involved with video making,” Bennett explains. “They could always train me in the technical aspects. What they needed was an individual with a voice. This combination set me apart in a competitive field of candidates. I know there were other applicants who, quite frankly, had more film and video production experience. But the skills I learned working for Media Services, combined with my science background, set me apart." Bennett is back in the U.S. now, working on new projects at BuzzFeed’s Los Angeles location. “Now I’m focused on new technologies/platforms such as virtual reality video and Snapchat,” he says. “The definition of what makes content is so broad now. It is really about determining the best way to communicate information. Is that a short, two-minute video? A 22-minute television show? Or a three-second looping .gif? That's pretty exciting!"